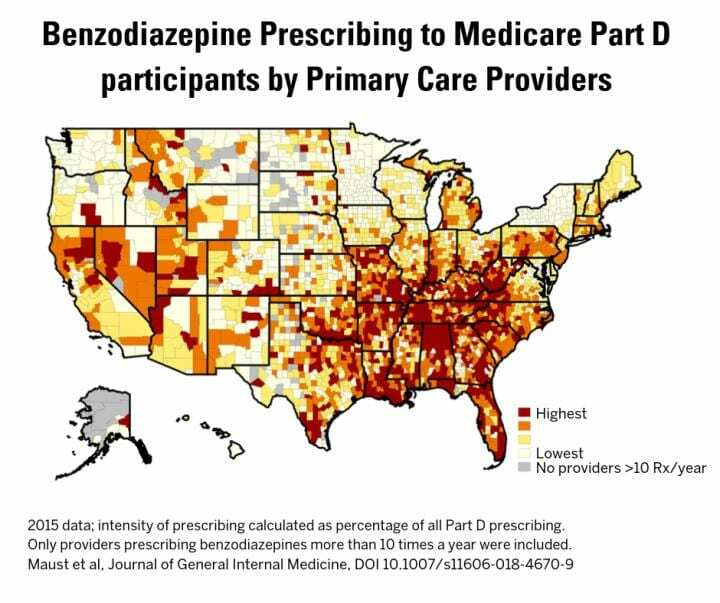 Mapped out county by county, the study shows wide variation in prescriptions of the drugs, called benzodiazepines. Some counties, especially in the Deep South and rural western states, had three times the level of sedative prescribing as others. The study also highlights gaps at the level of individual prescribers: Some primary care providers prescribed sedatives more than six times more often than their peers. These high-intensity prescribers of drugs such as Xanax, Ativan and Valium also tended to be high-intensity prescribers of opioid painkillers. The counties with the most intense sedative prescribing also tended to have lower incomes, less-educated populations, and higher suicide rates, the study finds. They also overlap with other maps showing high county-level opioid painkiller prescribing. "Taken all together, our findings suggest that primary care providers may be prescribing benzodiazepines to medicate distress," says Donovan Maust, M.D., M.Sc., the geriatric psychiatrist from the University of Michigan who led the study. "And since these drugs increase major health risks, especially when taken with opioid painkillers, it's quite possible that benzodiazepine prescribing may contribute to the shortened life expectancies that others have observed in residents of these areas." Published in the Journal of General Internal Medicine by a team from U-M Department of Psychiatry and the University of Pennsylvania, the study shows the power of data to highlight persistent inappropriate use of medications. The study is based on data about all prescriptions written in 2015 by primary care providers for patients in the Medicare Part D prescription drug program. The researchers combined it with county-level health and socioeconomic data from the County Health Rankings project. In the single year studied, the 122,054 primary care providers included in the study prescribed 728 million days' worth of benzodiazepines to their patients, at a cost of $200 million. The states with the highest intensity of prescribing — which the researchers defined as the proportion of all medication days prescribed that were of benzodiazepines–were Alabama, Tennessee, West Virginia, Florida and Louisiana, while Minnesota, Alaska, New York, Hawaii and South Dakota had the lowest. Primary care doctors accounted for 62 percent of the total. In fact, the researchers focused on primary care providers specifically because previous studies had showed they account for the majority of benzodiazepines prescribed to older adults, who are much less likely than younger adults to see a psychiatrist. Benzodiazepines have often been prescribed to ease anxiety or insomnia, though several studies by Maust and others have shown that patients receiving the drugs often don't have a formal diagnosis of either condition. But the drugs come with a price: clouded thinking ability, higher risk of auto accidents, falls and fractures, and a tendency to hook patients into long-term use despite their intended use as a short-term treatment. Benzodiazepines as a class are the second-most common group of drugs associated with medication-related overdose deaths, right behind opioid painkillers. Such risks have landed benzodiazepines on the national guideline for prescription drugs that people over age 65 shouldn't take, though their short-term use in treating anxiety or insomnia that haven't responded to other options is still considered acceptable. To contribute to the county-level study, a given primary care provider had to prescribe a benzodiazepine at least 10 times in 2015. For the individual physician-level study, 109,700 doctors were studied, since the 10 percent of prescribers who saw the fewest Medicare beneficiaries were excluded. The range was large – for the lowest group, about 0.6 percent of their total prescriptions were for benzodiazepines, compared with 3.9 percent of the highest-intensity group. That's a 6.5-fold difference in benzodiazepine prescribing. "That the same providers appear to be high-intensity prescribers of both medications is potential cause for concern," says Maust. Physicians with higher percentages of patients who were white, or who received the "Extra Help" payments available to low-income, low-resource patients under Part D of Medicare were also more likely to be high-intensity sedative prescribers. The researchers could not see data down to the patient-level in the available Medicare data, so they couldn't look at what conditions patients were listed as having, other clinical findings, or the patients' individual social and economic status. In addition to Maust, the research team included senior author Steven Marcus, Ph.D. of the University of Pennsylvania, and U-M Department of Psychiatry faculty L. Allison Lin, M.D., M.Sc. and Fred Blow, Ph.D. Maust, Lin and Blow are all members of the U-M Institute for Healthcare Policy and Innovation.